The comic book iteration of everyones favorite time traveling hero means to fill us in on his adventures between episodes of the almost 50 years long British television phenomenon. An inter dimensional intelligence has hijacked the TARDIS and caused the inner dimension to expand to the size of a galaxy trapping creatures and people from many different points of time and space. With the help of his trusty companion Clara, the impossible girl, and the crew of an American World War II bomber The Doctor forms a cunning plan to thwart the villain and save the universe. 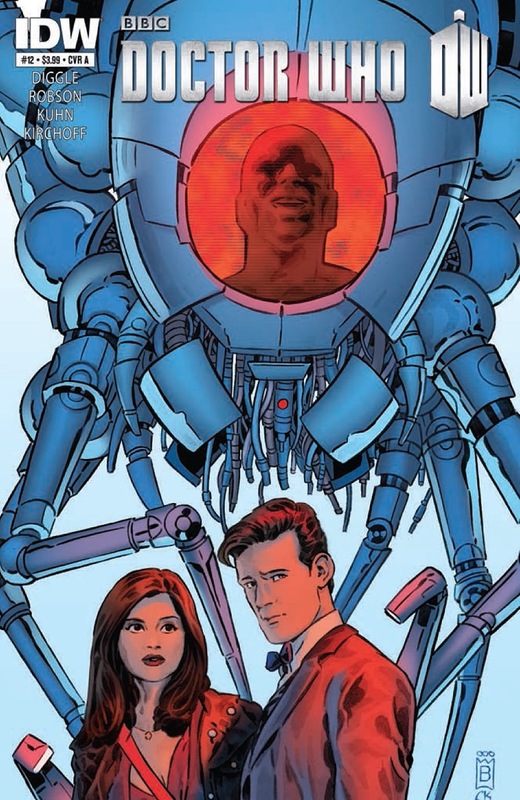 The reason this issue is especially important is because the villain’s origins are directly tied into The Doctor’s and the opening pages give us insight into the end of the time war and the name he took when his dark choices were made to doom his race for the fate of all creation. Many secrets of Gallifrey are revealed and we must be brave enough the hear them. If you are a fan of the mad man with a box then you need to catch up with the comic series and we’ll see you in November when the fiftieth anniversary episode premiers on the BBC. If you have yet to experience the adventures of the intrepid time traveler then what are you waiting for? Watch it on Netflix and head out to your local comic shop to find out what you have been missing. This entry was posted in comic books, reviews and tagged comics, Doctor Who, reviews. Bookmark the permalink.